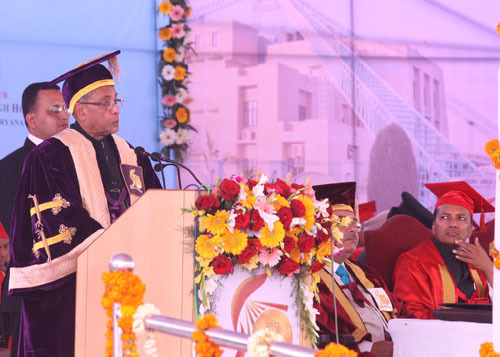 I am delighted to be here today to address the 10th Convocation of the National Institute of Technology (NIT), Kurukshetra. I congratulate the graduating students on this momentous day of their lives. I compliment the Institute for completing 50 years of rendering engineering education in the country. I am told that as part of the Golden Jubilee celebrations, the Institute is organizing seminars, workshops, lectures and training programs in the emerging areas of engineering and technology, science, humanities and management. NIT, Kurukshetra, has built for itself a reputation for delivering quality professional education in the country. It stands tall amongst the technical institutions of higher learning. Over the last five decades, it has produced outstanding engineers who have become an asset for the profession and the country. The dedicated service and tireless efforts of the faculty and staff of the Institute, in pursuing excellence in teaching and research is laudable. Knowledge is a true enabler of human empowerment. The contribution of education to the development of a nation is second to none. The famous poet, William Butler Yeats had said, (quote): "Education is not the filling of a pail, but the lighting of a fire” (unquote). The evolving demographic profile of our country, with two-third of our population expected to be in the working age group by 2025, presents us an opportunity for high economic growth and prosperity. This demographic dividend is ours for the taking, but for that, the youth must be qualified and trained to participate in national progress. As is well known, India is poised to be an economic power. In terms of purchasing power parity, the size of our economy is the third largest in the world. A growth rate of 9 per cent per year has been envisaged during the Twelfth Five Year Plan period of 2012 to 2017. Such scales of economic expansion need several enabling factors prominent among them being education. We have, over time, created an infrastructure of good educational institutions for imparting quality education at all levels. In the higher education sector, India is endowed with 659 degree awarding institutions and 33,023 colleges. The number of Indian Institutes of Technology has increased from 7 in 2006-07 to 15 in 2011-12. The enrolment to higher education institutions in the country has similarly increased, from 1.39 crores in 2006-07 to 2.18 crores in 2011-12. Engineering comprised 13 per cent of the total enrolment in 2006-07. This figure has since increased to 25 per cent. The growth rate of enrolment in Engineering, which was close to 25 per cent annually during the Eleventh Plan period, is the highest for any field of study. The Government of India’s 12th Plan Strategy includes a series of initiatives in the field of higher education. These include the establishment of more Central Universities, greater emphasis on technical education and distance learning, academic reforms, interest subsidy on education loans, establishment of innovation universities, expansion of existing institutions and a focus on better quality in research, infrastructure, faculty and curriculum content. The strategy gives due emphasis to greater outreach and more opportunities for all sections of our society. Governance reforms and restructuring is also a priority. Our institutes of higher learning continue to be challenged by problems of quality. An international survey indicated that there is not a single Indian university amongst the top 200 universities in the world. This calls for drastic action to reform the way education is imparted in our universities and academic institutes. A culture of excellence should be embedded in the thought process of our higher education providers. Quality, affordability and accessibility should become the mainstay of our higher education system. Wide regional variations should not be allowed to persist. We must take higher education, including technical education, to the doorstep of our people by innovations in the delivery system. Shortage of faculty is assuming serious proportions across all types of higher education institutions. Existing vacancies must be filled up quickly. Along side, technology should be marshalled for learning and collaborative information sharing. In this regard, the facilities extended by the National Mission on Education through Information and Communication Technology should be utilized to the fullest extent. For instance, important lectures could be shared with students belonging to geographically-distant institutions. Continuous progression is a defining feature of knowledge in today’s world. Unless our teachers are up-to-date with the latest information in their respective academic disciplines, they will not be able to disseminate knowledge of contemporary relevance to their students. Our universities and institutes must encourage and facilitate their teachers participation in international seminars, refresher courses and project work. Benefits of wider perspective and knowledge reciprocity would flow automatically. Every academic institute must recognize their outstanding teachers who have inspired the young minds to gather knowledge beyond text books. Such teachers are catalysts for holistic learning and new thinking. Such ‘inspired teachers’ could be encouraged to mentor junior teachers and students. Topics of national relevance such as water, environment, health, education and urbanization require in-depth analysis and research. Our institutes of higher learning must provide an academic framework that will facilitate a better understanding of these issues by our policy makers. In a world of depleting natural resources, future growth will have to be secured by innovation and constant technology up-gradation. India’s innovation balance sheet is not very encouraging. In 2011, 42,000 patent applications were filed in our country compared to over 5 lakh applications filed each in China and US. As per a recent ‘Forbes’ survey, only three Indian companies have been listed amongst the world's most innovative companies. This number will increase if the process of innovation is made a permanent feature in our institutions of learning. Our universities, engineering colleges and research and development centres should be the hotbeds of innovation. Setting up more incubation parks, building linkages with grass-root innovators, enhancing the number of research fellowships, and driving inter-disciplinary research are some of the immediate measures required to be taken. In our engineering colleges and technical institutes, there is also need to proactively pursue the scaling up of research in cutting edge technologies such as nanotechnology, biotechnology, embedded system design and technologies for sustainable development like renewable energy. Some studies have shown how alumni interest in the affairs of academic institution has done wonders. Alumni are associated in the affairs of an overwhelming majority of the top American universities like Harvard University. I am confident that the alumni of NIT, Kurukshetra, would also engage themselves fruitfully to the cause of this Institution. I am happy to note that NIT, Kurukshetra, has made notable progress by establishing dedicated schools of post graduate studies and research. I am confident your endeavour to establish closer research and development linkages with reputed national laboratories and organizations like Defence Research and Development Organization and Council of Scientific and Industrial Research will succeed in developing useful and frontier technology. Talent in academic and research positions in our academic institutions are difficult to retain due to lack of adequate flexibility in our systems. Our system must be geared to discourage any loss of intellectual capital and at the same time welcome scholars overseas including NRI and Persons of Indian origin to return to the country. Such an initiative will enable transmission of ideas and new methods of teaching and research from abroad to India. Academia-industry linkages must also be strengthened to include industry’s perspective in research and to derive market benefits from innovations. India is beginning to emerge as a knowledge economy. Our pool of qualified manpower will be the backbone of this new age. I hope NIT Kurukshetra will lead the way in transforming domain knowledge and skill into new competitive technologies for national reliance. I am sure the young men and women graduating today will face challenges in their life with confidence and bring sincerity, devotion and professionalism in all aspects of their professional work. Tolerance, discipline, humanism, and service to the society with all humility should be the guiding philosophy for all those who graduate from here. Your institute is located in the holy land of ‘Mahabharata’ where ‘Lord Krishna’ enunciated these principles through the ‘Bhagvad Gita’. The teachings of ‘Bhagvad Gita’ are perennial and relevant to the human civilization for all time to come. Carry this message with you always. I wish all the graduating students a fulfilling life and career ahead. I also wish the management and faculty of NIT, Kurukshetra, all success.